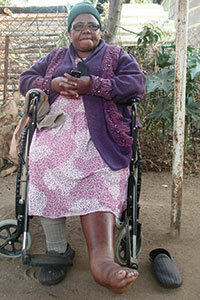 Worried about her swollen leg, 50-year-old Joyce Mthembu goes to the Barberton General Hospital to have it checked out. They give her an X-ray, tell her it is broken, and refer her to our regional hospital, the Rob Ferreira in Nelspruit. There she is put under the surgeon’s knife – with a most unsatisfactory outcome. When the government announced its plans to introduce the National Health Insurance (NHI) scheme, this writer – and I am sure countless other citizens – welcomed the initiative. After all, many of us cannot afford the enormous fees charged by medical aid schemes. And why not be excited about the NHI? It will mean improved hospital infrastructure and better medical care. Hey, bring it on. Well, the government has brought it on with the first phases – infrastructure development and improvement – already implemented, at least in my Barberton General Hospital and at the Rob Ferreira. And I must say, the make-overs and additions to these health facilities are quite impressive. But before the Minister of Health raises a champagne glass and cuts a piece from a gigantic cake in celebration for all the poor masses to see on national television – à la the ANC’s annoying habit – this writer is compelled to retract at least half the kudos. Reason being that, looking at Joyce Mthembu’s situation, one has to question whether the right priorities were set with the NHI’s implementation. The various reforms “will be phased in over 14 years”. Instead of phase one being infrastructural development and improvement, maybe it should have been the strengthening of health care and, specifically, more and better-qualified health care professionals. This would certainly have gone a long way to preventing the nightmare that Mthembu has had to endure – in the opinion of at least one doctor consulted by this writer. We’ll get to Mthembu’s dilemma in just a bit. First let us look at some of the specifics of what the NHI promises – “the various reforms will be phased in over 14 years” – and how, by comparison, Ms Mthembu has been horribly failed. It aims for better access to quality health services; for citizen access to district clinical specialist teams consisting of medical and nursing specialists who will be “an integral and permanent feature of health care delivery in South Africa”; and all health establishments (public and private) that render health services to the population will have to meet core quality, service, management systems, and performance standards. Tragically it would appear that Ms Mthembu was not afforded any of the above offerings by Nelspruit’s Rob Ferreira Hospital. She says when she first went to Barberton General to have her left leg looked at she did not understand much of what the doctors said. However, she’d been surprised to learn that the X-ray revealed a broken leg as she could not recall having done anything that would have broken it. Barberton General referred her to Nelspruit’s Rob Ferreira, Mpumalanga’s premier specialist hospital, where, she says, she was once again X-rayed and the diagnosis was the same. While Mthembu does not remember specific dates of her hospital visits (no big problem there, they’ll be in her file) she went under the surgeon’s knife in June last year. After the surgery she was instructed not to walk or put pressure on the leg for at least six weeks – that was the time she had spent recovering at Rob’s. Upon her release the hospital once again X-rayed her leg but did not communicate the results to her. A week after returning home, Mthembu tried to stand on her own – she had been hobbling along on crutches till then – and, to her astonishment, the leg buckled under her, just above the ankle, warping to the left. As a result she is, at least for now, wheelchair bound. This writer showed photos of Mthembu’s leg to two independent doctors for their expert opinions. It would appear that the bones at the point of the surgery did not fuse back together either properly or sufficiently. So, when she put her weight on it, “an anatomical defect” occurred. The follow-up, the doctors said, would have indicated whether or not proper fusion had taken or was taking place. And here’s the thing that makes one’s blood boil at the seemingly unprofessional and insensitive medical staff: according to Ms Mthembu, when she went back to the hospital to point out the deformity, hospital staff only took down her phone number and told her they would call her. Don’t call us we’ll call you – imagine that! That was last year and she has not heard from anyone since! In fact, what one of the doctors described as outright negligence in the treatment of Ms Mthembu, began after her initial visit to Barberton General at which she was only able to secure an appointment at Rob’s two weeks later. 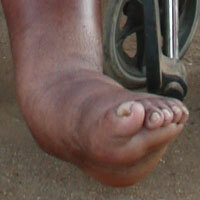 The poor woman is diagnosed with a broken leg and has to wait two weeks to have it attended to. Excuse my French but once again this writer finds himself exclaiming, What the f****! Why didn’t the staff at the Barberton Hospital insist that this was an emergency? Furthermore, after Rob’s had diagnosed the “anatomical defect”, one would think that the hospital would supply her with a wheelchair. But that was not to be. The wheelchair came weeks later, courtesy of the Barberton Hospital. At least this time they did something right, albeit a little too late. The doctors consulted said the only solution was for Rob’s to provide Mthembu with immediate consultation by an orthopaedic specialist to see whether the damage can be repaired. However, they warned that the problem had become “clinically complicated”. Meanwhile, Mthembu has retained the services of a lawyer to pursue civil action.